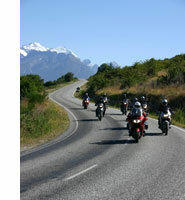 The New Zealand Explorer motorcycle tour takes you on some of the many great biking roads NZ has to offer with an emphasis on the more untouched areas of the country. Of course, some of the main attractions shouldn't be missed either, so they are included in our itinerary. For more adventurous riders there will be opportunities to ride some gravel road alternatives en-route. The tour is a 21 day Hotel and Lodge tour with good quality accommodation in carefully selected locations. Your luggage is transported by your guide in the support vehicle. The following tour description is a brief outline of what awaits you on your 19 days of travel, through the diverse country of New Zealand. In the North Island you will visit the stunning beaches and twisty roads of the Coromandel Peninsula, Rotorua's Geyserland and Maori settlements. The journey continues on less traveled roads in the King Country and Taranaki through volcanic landscapes and deep sub tropical forest before reaching the southern part of the North Island by Wellington. In the South Island Kaikoura awaits you with seals and whale watching. You will travel through some of the passes crossing the Southern Alps, visit Central Otago's Gold fields and early settlements and of course Queenstown and The Milford Sounds. The final leg of the tour travels north to the central lakes before ending in Christchurch.